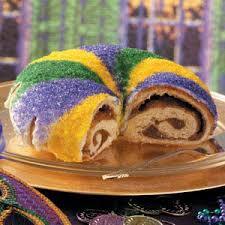 The Carnival season ends on Mardi Gras Day, February 9, which is a very early end to Carnival this year. Interestingly, January 6th is also the birthday of the Maid of Orleans, Joan of Arc who is honored in New Orleans with a startlingly gold statue and her own lovely parade today. That parade along with the Phunny Phorty Phellows parade held on the St. Charles streetcar line tonight are the first parades of our season. As you probably can tell, all of this is closely linked to the Catholic tradition deeply embedded in French Louisiana. 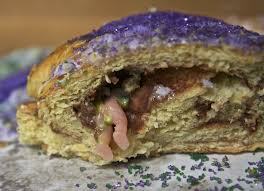 The link to the video shows how a commercial king cake is made, which is the cake we eat throughout the season. The tradition is explained well in the video, so I’ll just add that with the surge in local and artisanal foods, many more types of king cake are now available in the area. 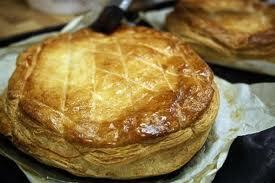 Whole wheat cakes, french-style Galette des Rois cakes and more can be found at markets, at stores and bakeries. Happy Carnival! Yes that is a plastic baby in there- If you get that in your piece of cake, you buy the next. Restaurant Day enthusiasts sell food that they have prepared themselves in locations as creative as the fare they serve up – in parks, on street corners, in courtyards, or in their kitchens. The foodfest takes place roughly every three months. It offers anyone the opportunity to set up a restaurant, coffee shop or bar, for just one day, without having to apply for official permits – as long as alcohol is not on the drinks list. Restaurant Day is the world’s biggest food carnival and happens worldwide four times a year. All together 9600+ one-day restaurants by estimated 38 500+ restaurateurs have catered for estimated 1 060 000+ customers in the past Restaurant Days. One-day restaurants have so far popped up in 56 different countries including Argentina, Aruba, Australia, Austria, Bangladesh, Belgium, Brazil, Bulgaria, Canada, China, Colombia, Czech Republic, Denmark, England, Ecuador, Estonia, Finland, France, French Polynesia, Germany, Greece, Guyana, Hungary, Iceland, Israel, Italy, Japan, Kazakhstan, Latvia, Lithuania, Malta, Mexico, Mozambique, Nepal, Netherlands, New Zealand, Nicaragua, Norway, Poland, Portugal, Romania, Russia, Rwanda, Singapore, Slovakia, Slovenia, Spain, Sweden, Switzerland, Tanzania, Thailand, Turkey, Ukraine, Venezuela, USA and Uzbekistan. Please note that all restaurants with a clearly commercial, political or religious aim, or restaurants linked to existing commercial brands, or advertising a commercial space or a business, will be removed from the service. Today is a holiday in my city and region, combining the best parts of tradition and public spectacle, and food is an important part of the tradition of Carnival. Our own Poppy Tooker talked about it on NPR last week. “That the mayor and City Council cease and desist from governance. Living in New Orleans used to mean that I had a mild winter (if any) to deal with each year and January was about celebrating Carnival from Twelfth Night up until Fat Tuesday (Mardi Gras). Now as a market consultant, I spend the winter traveling to conferences and meetings, oddly almost all held in the northern climes! Even with my aversion to cold, I am excited to be returning to Vermont for my third visit with NOFA-VT, and the second time I will be attending their Direct Marketing Conference held in lovely South Royalton VT.
Beginning last fall, I started work with NOFA-VT and the Vermont Agency of Agriculture to study their card and token currency systems in the markets and comparing them to other states’ systems in view of the 2020 implementation of WIC to EBT cards – as well as the new technology that is swirling around like Square and the new upcoming Novo Dia Group smart phone app for cc/debit/food stamps. Also included in this research is the need to ascertain if these systems (which of course include incentives, FMNP coupons, WIC vouchers and in some states veggie prescriptions too) are working well at market level and how to measure them. I have been calling on my colleagues across a dozen states and networks to hear their analysis which has been shared most generously. Now, I go to Vermont to gather some case studies from farmers and market managers to round out the raw data which then will need to be crammed into a manageable report for Vermont come early spring. And, email me or call me if you have data on a network or state level that you wish to share. case studies/research, farmers markets, farmers/farming information, food stamps (SNAP), incentives, market vendors, national food system work, SNAP, state associations, Where's Dar now? Economic measurement is the first ruler we need to apply to the world of food systems, and specifically to our farmers markets. In many ways, Mardi Gras has a lot of similarities to the alternative food system- it’s informal, held mostly within the public space and all about entrepreneurs. This report shows how spring Carnival season adds value to the GNO region. This type of evaluation wis possible for markets to have for their own by using marketumbrella.org’s SEED tool which shows the impact a farmers market has on its own region. How Mardi Gras Boosts New Orleans' Economy.